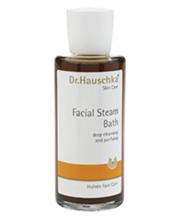 Facial Steam Bath - For All Skin Conditions. This steam bath carries vital herb extracts to all skin conditions. Moist heat helps to loosen impurities by softening and clearing clogged pores. Use after cleansing and toning, and follow with the use of Dr. Hauschka Cleansing Clay Mask. Extracts of: daisy, nasturtium, witch hazel water alcohol.